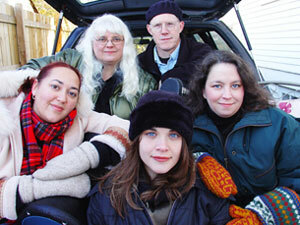 A Minnesota dance band is preserving the folk music fast disappearing from Europe. Four women and a man make up Orkestar Bez Ime, pronounced 'ore keh star bezz EE may'. That's Bulgarian for orchestra without a name. They play dance tunes from Bulgaria, Romania, Hungary and lots of other places. OBI as they like to be called, perform the dance tunes they collect at venues around the region. St. Paul, Minn. — A good share of European folk or ethnic music is unfamiliar to American's besotted with this country's popular culture, and OBI vocalist Natalie Nowyski says it is increasingly unfamiliar to Europeans. Nowytski grew up in a northeast Minneapolis home where Ukrainian was the first language. She says momentum to preserve Europe's ethnic music is growing in this country. "(European)kids aren't getting into it. They're not following the traditions of their ancestors in the actual cultures as opposed to here. I almost feel there's more of a following in North America than in Macedonia or whatever," she says. OBI's five members, all from the Midwest, met when they were musicians and vocalists with the Twin Cities-based Ethnic Dance Theater. They play violin, clarinet, accordian, a batch of unusual folk instruments, and a few of them sing. They've spent years studying and learning the intricacies of the music they perform. As a dance band they play to get people on their feet. However violinist Colleen Bertsch says beginners need not worry about getting off on the right foot. Improvisation is encouraged. It helps, Bertsch says, that OBI has a camp following of ethnic dancers who are more than willing to show newbies how to move. "You will dance with somebody on either of you that you don't know; you don't have to look at them and you don't have to say a word to them. But you're sharing this common experience with them and you create this bond and it's a beautiful thing, and that's what art is supposed to do," she says. The supply of immigrants fueling Orkestar Bez Ime's European folk music collection is deep and wide. OBI accordionist Dee Langley says people settling here willingly pass along the musical keys to their culture. "I find that the people who move here are ready to take on a new country and new life and so they give us their secrets and we hold on to them and I think we've preserved a lot," she says. Orkestar Bez Ime members perform some of what they've learned at the Minnesota Historical Society's final free outdoor music event Tuesday evening, August 30, 2005 in St. Paul.